Premium Quality, Precise energy and Durable Power Supply. 58397 Premium Quality, Precise energy and Durable Power Supply. These batteries give the precise energy supply which ensures that your cordless phone is ready to use – anytime.These also have Premium Quality for the growing AAA- sized cordless phone market.These have Optimized Capacity for Cordless Phones which need High Frequency Recharging Cycles (almost daily).These are Rechargeable hundreds of times without any bad effect on the memory.These provide Precise Energy and Durable Power Supply. 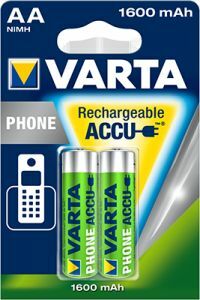 To Recieve updates and possible rewards for Varta AAA 550 mAh Accu Phone please sign in. To Recieve updates and possible rewards for Rechargeable Battery please sign in.